Indigo Furniture celebrated their status as one of the most iconic wooden furniture manufacturers in the United Kingdom with a “Best of British” themed weekend at their showroom in Matlock at the very heart of the Peak District. 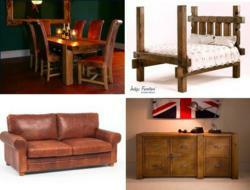 Indigo Furniture are just as famous for their traditional values and traditional techniques as they are for their unique style of rustic yet modern chunky wooden furniture. The event, which took place last weekend, put the spotlight on all of the key skills and expertise it takes to build each item from beds to wardrobes and everything else in between. With a range of live demonstrations the Indigo showroom was transformed into a veritable feast of sights and sounds for both past customers and those who were looking to inject some Indigo design into their own homes in the near future. The event took place over the entire weekend of the 23-25th March and as is always the case with Indigo Furniture they went one step further to make it an even more spectacular event for everyone who attended. By simply reserving a place online for the event Indigo Furniture had a free gift waiting for every single person who RSVP’d. Not only was there special gifts for those on the RSVP list but Indigo Furniture also heavily discounted items of furniture across their entire range, including their extremely popular Riven Oak Furniture range. Every single piece of handcrafted Indigo Furniture had 10% taken off while Indigo’s much loved furniture packages also had 5% off their full price. There are four different types of furniture packages available from Indigo Furniture with one each for the bedroom, dining room and living room as well as one package exclusively for their Riven Oak Furniture range. The packages are the perfect way to kit out an entire room in one go and the extra discount went a long way to help customers transform rooms into the home of their dreams. The Best of British event truly cemented Indigo Furniture as one of the leading furniture designers in the UK and one of the few who still use traditional craftsmanship in this modern era. Their traditional techniques have meant that they have been able to give all of their furniture 15 year guarantees which is an impressive feat for an industry which usually offers much smaller guarantees. The pride and confidence in their work is one of the defining qualities that sets them apart from their competitors and something that every single visitor over the weekend was able to see for themselves at the Best of British event.